(Francisco Kjolseth | The Salt Lake Tribune) Rep. Gage Froerer, R-Huntsville, alongside House Speaker Greg Hughes and former U.S. Attorney for Utah Brett Tolman, at right, holds a news conference at the Capitol on Tuesday, Feb. 20, 2018, to discuss HB379, which would end the death penalty in Utah. When lawmakers considered abolishing Utah’s death penalty system in 2016, Rep. Gage Froerer was against the legislation. Two years later, the Republican lawmaker from Huntsville has changed his position — and is now sponsoring a bill that could eliminate capital punishment in Utah. 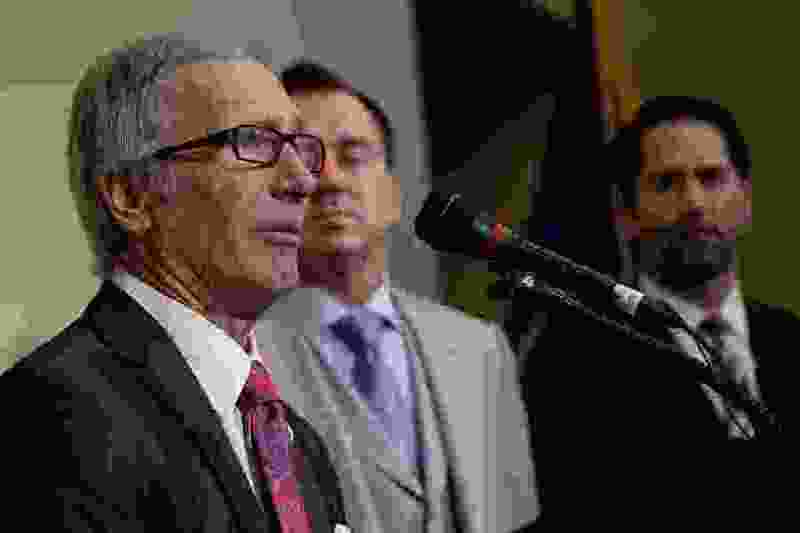 “I think it’s very clear that this, as it exists today, is not good public policy,” Froerer said during a Tuesday news conference at the state Capitol. Utah’s current death penalty system is inefficient, Froerer said, and expensive. And it often leaves family members of victims waiting through decades of appeals before a killer is executed and the case is closed. HB379 would prohibit Utah prosecutors from seeking the death penalty after May 8. It still would allow for the nine men currently on death row to be executed, and would allow prosecutors to continue to seek executions in current cases — so long as they file their intent to do so before the May deadline. 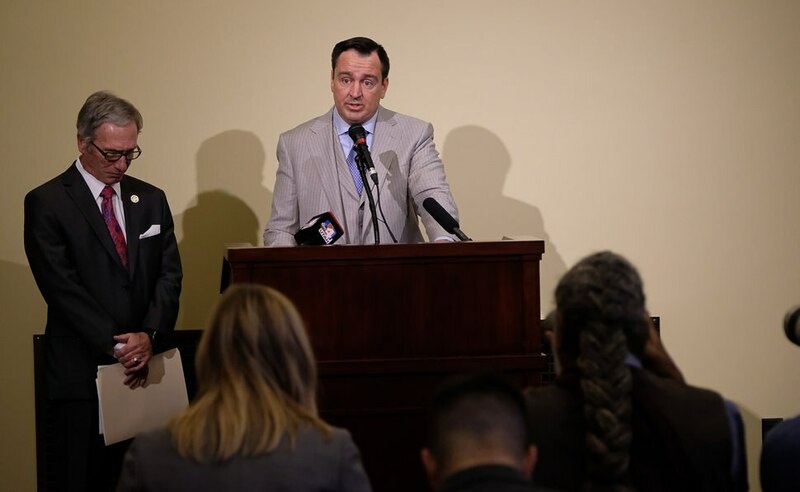 The bill has the support of House Speaker Greg Hughes, who said Tuesday that while eliminating the death penalty has traditionally been viewed as liberal or “soft on crime,” he is a “staunch conservative” who wants the punishment ended. (Francisco Kjolseth | The Salt Lake Tribune) Rep. Gage Froerer, R-Huntsville, alongside House Speaker Greg Hughes, holds a news conference at the Capitol on Tuesday, Feb. 20, 2018, to discuss HB379, which would end the death penalty in Utah. Froerer and Hughes acknowledged that passing the bill will be an uphill battle with Utah’s lawmakers. But they both stressed that abolishing capital punishment aligns with conservative values — it’s pro-life and it limits government power and spending. Utah legislators came close to abolishing the death penalty in 2016, but the bill never reached the House floor before the midnight deadline on the last night of session. Hughes said Tuesday that they were likely just a half-dozen votes shy of passing the bill then. Hughes said some lawmakers hesitated to vote in support of ending the death penalty at that time after hearing “heart-wrenching stories” from family members of murder victims who were in support of capital punishment. Brett Tolman, former U.S. Attorney for Utah, said Tuesday at the news conference that most of the family members of victims with whom he came in contact during a decade of prosecuting crimes did not want the death penalty imposed. The threat of the death penalty also did little to deter crime, he said. Like Froerer, Tolman said he once supported capital punishment. 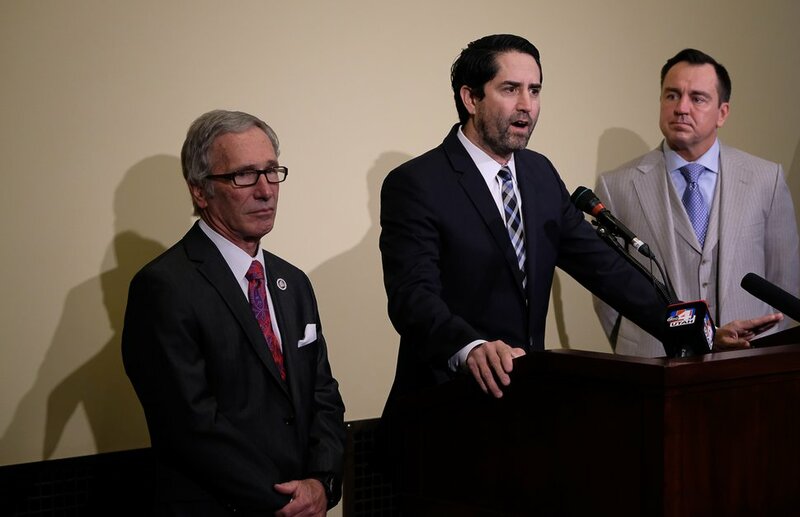 (Francisco Kjolseth | The Salt Lake Tribune) Former U.S. Attorney for Utah Brett Tolman, center, speaks on behalf of HB379, which would end the death penalty in Utah. Tolman was joined by Rep. Gage Froerer, R-Huntsville, left, and House Speaker Greg Hughes on Tuesday, Feb. 20, 2018. It’s expected that lawmakers will consider HB379 Wednesday morning during a House Law Enforcement and Criminal Justice committee hearing. If legislators pass the bill, Utah would join 19 other states and the District of Columbia in outlawing capital punishment. Groups like American Civil Liberties Union of Utah, Libertas Institute and Conservatives Concerned About the Death Penalty have all voiced support of abolishing Utah’s death penalty. Libertas President Connor Boyack said that as people learn more about how the death penalty works, they are less likely to support it. While criminals should be held accountable, he said, the costs and risks of killing someone who is innocent should be considered. Legislative analysts in 2012 estimated that a death sentence and years of appeals cost $1.6 million more than a life-without-parole sentence. Another more recent report estimated that Utah and its counties have spent almost $40 million to prosecute the 165 death-penalty-eligible cases that have been filed in the past two decades. Only two cases in that time have resulted in a death sentence. Another bill being considered this year is HB70, which seeks a more in-depth study of how much it costs to carry out capital punishment in Utah, including the amount of money spent by law enforcement, courts and other entities. That bill passed the House on Tuesday and will now be considered by the Senate. The last execution was carried out in 2010, when Ronnie Lee Gardner was executed by firing squad for the 1984 murder of attorney Michael Burdell during Gardner’s failed escape attempt from the 3rd District courthouse in Salt Lake City.